A Marysville Washington customer who loved her chickens, turkey, geese and ducks wanted to build a pole barn and garage on her property. 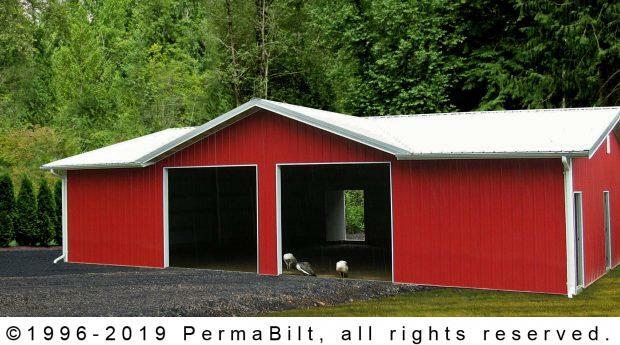 In working with her PermaBilt® Building Representative, they worked on a design that made sense to her and her animals. And what they developed was a standard building with garages in the middle and barn space to either size. But in looking at the final design, it was too plain for her. We modified the roof giving the barn and garage a bit more character. With the classic barn red color, the new barn and garage would stand out nicely. She readily agreed. Upon completion her animals moved in, and according to our customer, were very happy with their new home.